A woman has suffered serious injuries and a second has sustained minor injuries after two collisions on the A47 in Peterborough this morning. Police were called at 5.26am by the fire service to reports of a two vehicle crash involving a Ford KA and Mercedes Sprinter on the A47 westbound by the Gresley Way turning. 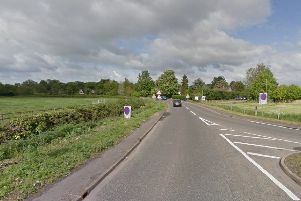 Emergency services were further called about a second crash on the A47 less than 100 yards to the Bourges Boulevard turn off between a Fiat 500 and Ford Transit. The A47 junction with Bourges Boulevard was closed as well as the Gresley Way, Topmoor Way and Fulbridge Road junctions. The driver of the KA in the first incident, a woman, sustained serious injuries and was taken to Peterborough City Hospital. A woman from the second incident sustained slight injuries. No further injuries are reported. There are reports that the accidents are due to a large fire on Ivatt Way that caused a large amount of smoke to billow across the carriageway. At 5.21am one crew from Dogsthorpe and one crew from Stanground were called to a fire on Ivatt Way in Ravensthorpe, Peterborough. Firefighters arrived to find a fire in a large steel storage container that was spreading quickly to the surrounding area. The fire mainly involved plastic material that was being stored in and around the container. Wearing breathing apparatus the crews extinguished the fire using a hose reel and returned to their stations by 7.25am. The A47 Soke Parkway has now reopened as of 8.40am, but residual delays remained with traffic queuing back past the Eye Green turning on the A47, as well as along the A16, as well as along Lincoln Road and Werrington Parkway.